The Hook2 Splitshot from Lowrance combines DownScan imaging with Wide Angle High CHIRP Sonar. Depicting what’s below your boat in great detail, this 7” combination GPS/Fishfinder with Navionics+ Charting is ready for any day out on the water. 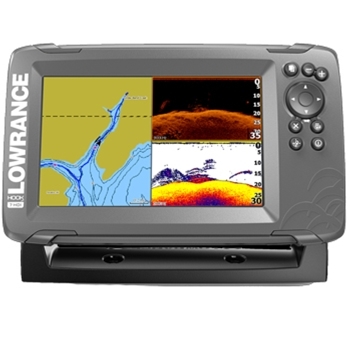 The Lowrance Hook2 7 SplitShot is one of the most intuitive Fishfinder chartplotter combination units that you will ever put your hands on. With the Superior, High performance sonar functionality all the way to the detailed charts, and crisp 7” SolarMAX push button display, the Hook2-7 is sure to turn heads. The Hook2’s built in sonar is 2nd to none covering twice the bottom area of similar fishfinders on the market. You’re able to see high definition fish targets and locate structure easier and faster than ever before. The included SplitShot transducer offers temperature and very accurate depth readings. With the automated sonar settings, you never have to worry about adjusting the fishfinder while you’re trying to enjoy your fishing trip. The downscan imaging offers picture like view of structure beneath your boat while the CHIRP sonar helps you locate those structure hugging fish. The expanded internal memory of the Hook2 now offers storage for up to 100 routes and 3,000 waypoints and favorite fishing spots. 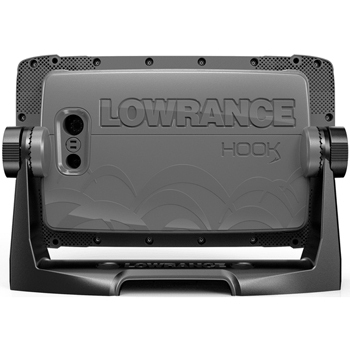 The engineers and designers at Lowrance took today’s technology from smartphones and incorporated it into the screen layout of the Hook2 -7 Nav Plus bundle to create the simplified menu setup. The included high-resolution Navionics Nav Plus charting covers the entire Coastal US and inland lakes with detailed information. You’re always able to upgrade the included charting to C-Map, Navionics, or Insight charting to suit your needs. If you’re looking for an easy to use, affordable combination Chartplotter and Fishfinder, look no more; the Lowrance Hook2-7 Split Shot with Nav Plus charting has everything you’re looking for! 7” SolarMax Display with Button Operation. Take a look at the Lowrance HOOK2 9" SplitShot. The Lowrance Hook2 Power Cable is compatible with all Hook 2 5", 7", 9" and 12" units.